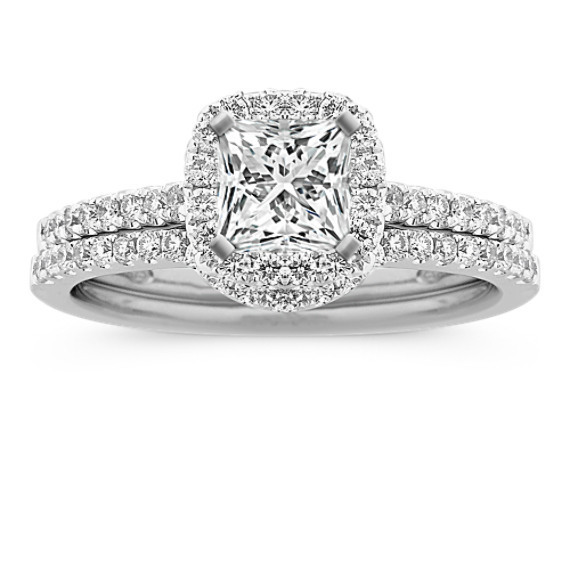 Halo Diamond Wedding Set with Pave-Set Round Diamonds | Shane Co. Dazzling in diamonds, this spectacular halo wedding set features 57 hand-selected round pavé-set diamonds, at approximately .53 carat total weight. Sparkling in an elegant 14 karat white gold setting, this piece serves as the perfect backdrop to the 1.00 carat center diamond of your choice. Went and looked one day and fell in love immediately! It is the perfect size and love the wedding band that comes with it! It is perfect with the smaller size hands that I have! I love everything about this ring. I went and tried it on and it was just so perfect. I love even more that it has a band to go with it. Its perfect!